You may know that you can modify the Label and Status fields to meet your needs, but what if you want to track even more items? With Custom Meta-Data, you can make your own. Want to know more? Here’s how to get started. 1. Make sure the Inspector is open (if not, click the Inspector icon at the top right of your screen). 2. 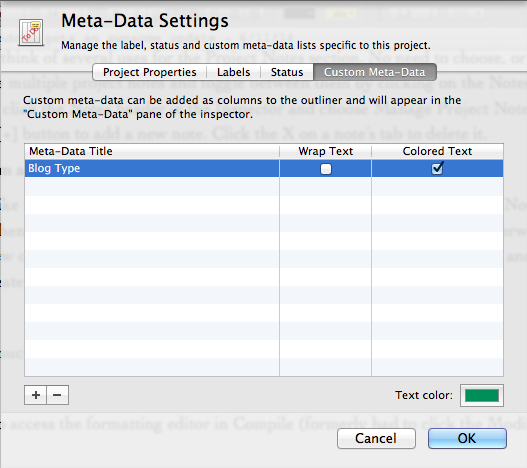 Click the Custom Meta-Data button at the bottom of the Inspector. 4. 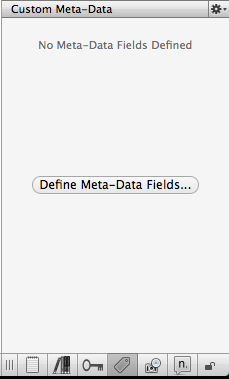 Click the + button to add a new Meta-Data field, then enter the desired field name, and click OK. I called my field Blog Type. – If you want all of the entered text to show (e.g. in Outline view), and you expect your values to be long, check the Wrap Text box. – If you want the text color to be something other than black (so it will stand out in contrast to other data), check the Colored Text box and use the Color Picker to select a color. 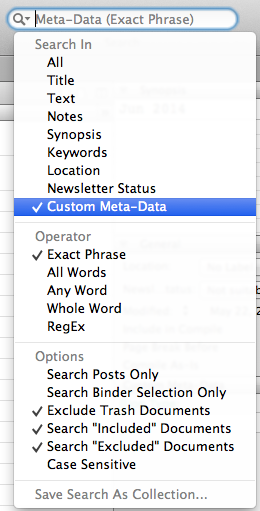 Once you’ve created a custom data field, it shows up in the Inspector any time you click the Custom Meta-Data button. To add a value to it, just enter the value in the text box below the field name. You can also add values in the Outliner view as shown in step 3 below. 1. In the Binder, select the folder you want to view in the Outliner. If the Outliner doesn't show, click the Outliner button (far right button in View Mode section of toolbar) or go to View–>Outline. 2. To see your Custom Meta-Data, click the Column Selector button at the far right end of the Outliner header bar (looks like a >> on Mac or a down arrow in Windows) and choose the desired field. 3. To add/edit the value for a document, double-click in the cell under the custom field’s header and enter the desired value. 1. To search by Custom Meta-Data, type the value in the Search box at the top right of your toolbar. 2. Click the magnifying glass icon and choose to search in Custom Meta-Data. The resulting documents will show in the Binder. 3. To save the search, click the magnifying glass again and choose Save Search As Collection. Saved searches show up in your Collections. + Once created, custom data fields can be added to any document in the project. + Can be used to create a collection, which in turn can be used as a filter for choosing which documents to compile. + Allow you to track additional data not already provided for. – User cannot create drop-down list to limit values and control for errors. – Can only be viewed in Inspector and Outliner. If you want to store more data, but aren’t a big fan of how Custom Meta-Data works, try Keywords instead. Scrivener is nothing if not flexible. Need more help? Sign up for an online class, read more Scrivener articles, or schedule a private training session. Write on. This is so over my head, but I appreciate the information anyway. I’ve never fussed with Scrivner that much. I made it look pretty and organize appropriately and I’m good. I’ll have some less “scary” topics coming soon. Gotta get something in for everyone, and I covered a lot of the basics in the 1.x posts. I’ll go back and revisit those topics that need an update too. Let me know if there’s anything you’d like me to cover. Hi Gwen – found you via the Scrivener FaceBook page. Thanks for the tutorial. As for coverage ideas, would love to see a post on setting up a project, i.e., creating templates, structure, etc. Yes, it’s a fairly straightforward feature, but it can be a powerful one taken to the extremes. The recent NaNoWriMo template the Scrivener people made is a good example. Thanks for stopping by, Gary, and for letting me know how you found me. 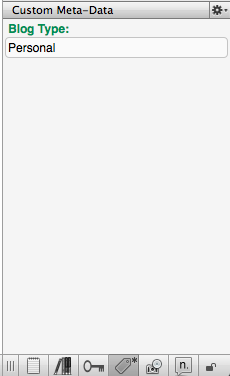 I’m working on a template post for 2.x, because I get more hits from “scrivener templates” than anything else. My previous post on it (http://gwenhernandez.wordpress.com/2010/03/30/tech-tuesday-templates-in-scrivener/) just covered the basics on how to create a template. I’m trying to decide how to take it to the next level. I appreciate the suggestion and hope to see you here again! Great post!! Not sure if I like the snow…. Thanks, Tolo. I like the snow, but I wish it didn’t fall across the words. It can get annoying. Interesting that Scrivener can do this, but equally helpful would be to explain WHY to use this customized field. Say you’re writing a long piece with multiple text files in the binder. In outline view you can track the plot developments, but if you add a ‘when’ or ‘where’ or watever meta-data column, you can also track those in the outline view, as well, thus you have a much more functioning planning outliner right in Schivener. Absolutely, Tony. There are so many things you could use custom meta-data for. Thanks for the example. I was recommended this blog by my cousin. I am not positive whether this put up is written through him as no one else recognise such designated approximately my trouble. You’re wonderful! Thanks! Wah, I had no idea you could do that! Brilliant stuff. I only started seriously using Scrivener for my current WIP, prior to that I just kinda messed around with it and used it like Word. Ha! Now I know the cool things it can do I’ll probably use it forever. I don’t know if it matters, but is this guide for the Mac version or the PC one? Using Scrivener for Windows. Not seeing the Custom-Meta-Data in either the Tool Bar/Project or Inspector lower footer/tool/setting. Is this something that is only available to Mac? SSpjut: Sorry, this post was written before the Windows version was released. For right now, Custom Meta-Data is still Mac only, but should be coming soon to PC. Have you tried keywords? I have. Playing around with ways to utilize it for identifying POV and search. Also, trying to set Formatting ‘preset’, but can’t locate that in either the Format Bar or Tool/Options. Is that also a ‘Mac’ only? SSpjut: Format presets are also currently Mac only. You might check the latest Windows beta release list to see what’s coming with the next update: http://www.literatureandlatte.com/forum/viewtopic.php?f=34&t=27124. What I can’t figure out is when should I use keywords and when custom metadata? I started in keywords because I was on Windows, but as I look through custom metadata, I can’t figure out the pros/cons of one over the other. Liana: Keywords are best for repeating values. So let’s say you were tracking the scene purpose, and each scene might have more than one (e.g. present a story question, raise the stakes, move a character arc forward). Keywords beat out Label or Status because those can only hold one value. They also beat out custom meta-data because with custom meta-data you have to type in the value from scratch every time and you might make a data-entry error. So, that leads me to custom meta-data. I think it’s best when you want to attach something to your document as meta-data, but the value will–or could be–different for every document. One of the best examples I’ve seen is to use custom meta-data for a To Do list. You type into the text box whatever needs to be done for that document (e.g. research tree frogs, come up with better opening hook, contact XYZ Co for permission to use their brand). Then the values are visible in the Outliner view, where you can see all of your documents and their values in one place. Hope that helps! Gwen, is there a way to add keywords or custom meta-data entries to multiple files at once? Say, to a list of files in a search result? Hi, Craig. To add keywords to more than one file at a time, open the Project Keywords window (Project–>Show Project Keywords). Select the desired files in the Binder (or search results list), then drag the keyword onto any of the selected files. While you can’t do something similar for custom meta-data fields, what I recommend is viewing the Draft folder (or the multiple selection of files in the search results list) in Outline view (choose View–>Outline). Click the small down arrow button at the far right of the Outline header to select your custom meta-data field so it shows as a column in the Outliner. Then you can go down the line editing the field value. Hope that helps! Many thanks, Gwen (though in my Windows version it doesn’t work to drag a key word to the Binder, only to the search results in the main window. Also, is there a way to number the items in the binder? I’d love to have dynamically numbered chapters without having to compile to see them. Craig: Sorry, I didn’t have my PC in front of me to test and didn’t realize dragging keywords to a search results list wouldn’t work. It does work for PC to drag onto selected items in the Binder when not viewing search results. Unfortunately, the only way to number the Binder items is to give them a number manually in the title. Bummer. That means you have to renumber them all if you shift anything around. I’ve got 75 chapters in my WIP.